Gateway to Death? | Where Have You Been Lately? After I’ve seen this one show in History Channel titled Most Extreme Airports where Tenzing-Hillary Airport or more popularly known as Lukla Airport topped the list, I have always wondered how extreme the airport really is. Is it really a gateway to death? You’d be surprised with what I found out when I finally had the chance to land and take-off in Mount Everest’s starting point. 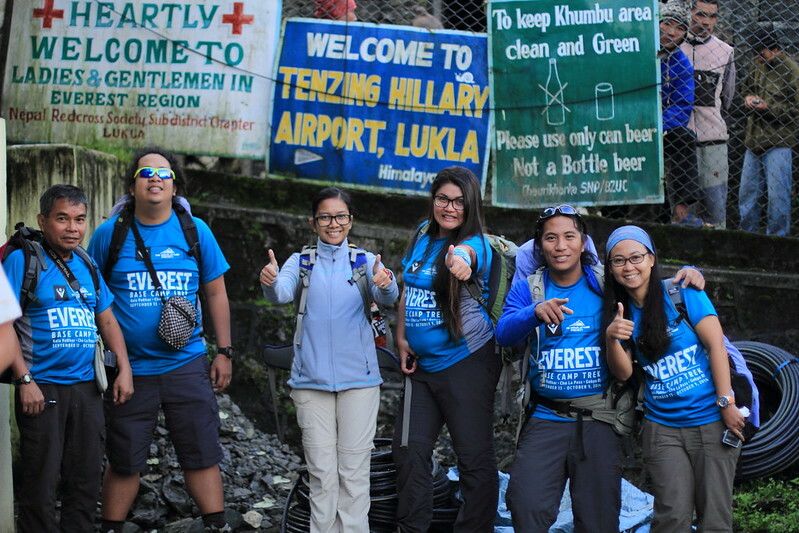 During the initial stages of our preparation and planning for our Everest Base Camp (EBC) trek, my team The Himalayas Project first talked about our itinerary. How much days do we need? When is the best time to trek? How many buffer days are needed? 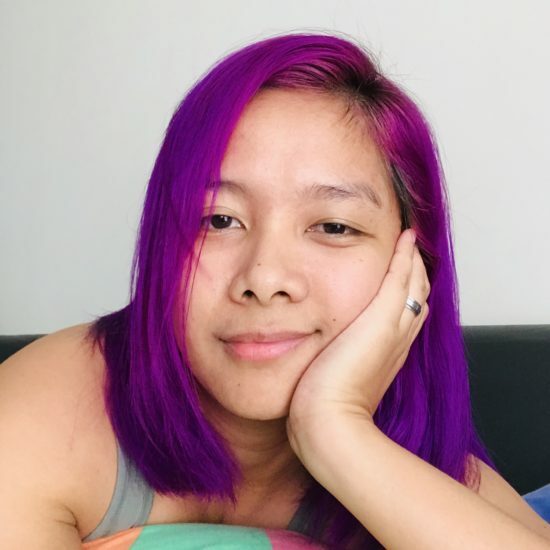 Buffer days, I said? Buffer time or days is the extra time or days added into itinerary, which is used to make up for unexpected situations like accidents, flight delays, etc. without affecting the whole itinerary. So why did we talk about adding buffer days? I think one factor that makes Lukla extreme is its weather and location. If sun is shining brightly in Kathmandu, it doesn’t necessarily follow that Lukla has the same weather. 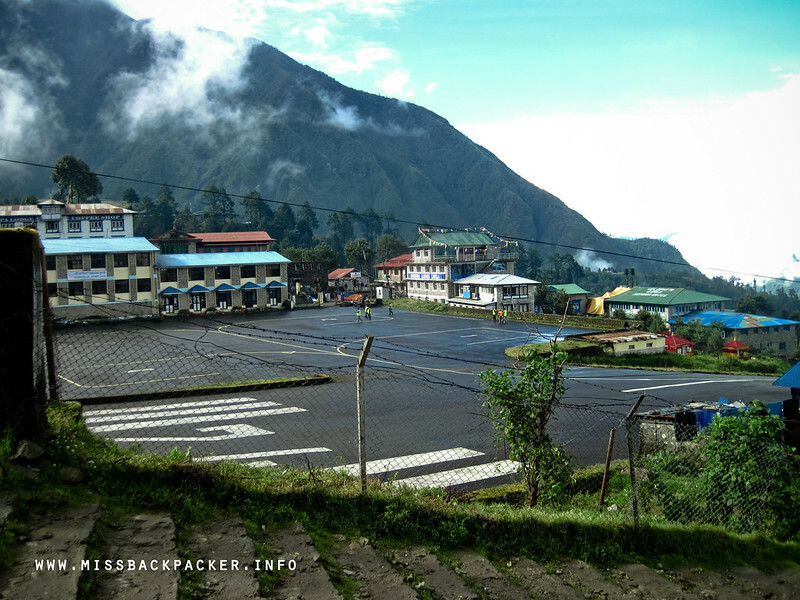 Lukla Airport is situated 2,860 meters above sea level (MASL) on a slope and between mountain ranges thus making it vulnerable to extreme shifting of weather. 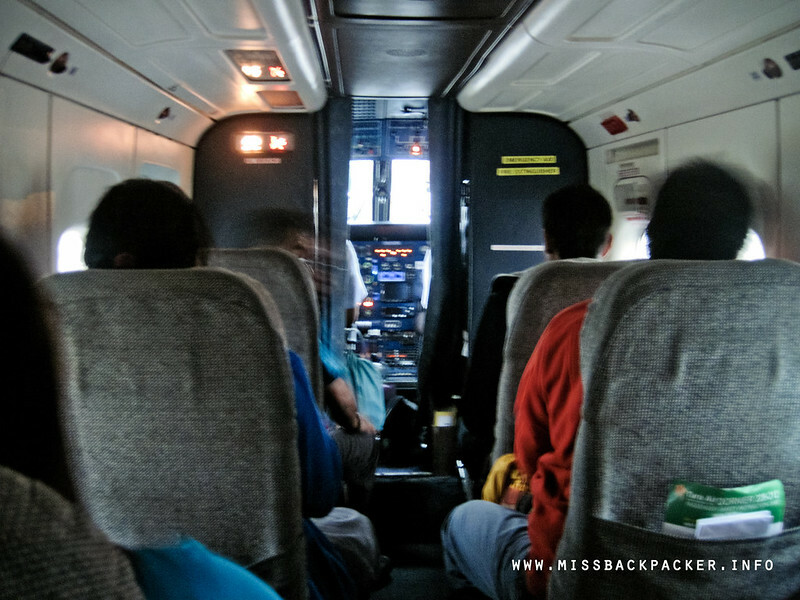 The night before our flight to Lukla Airport, we were all anxious on whether our flight would push through or not. When we heard our guide Bikal knocking on our door at 4 AM the next day, we thought it’s our lucky day. After just a few minutes of collecting ourselves, we’re on our way to the domestic terminal of the Tribhuvan International Airport. We arrived early and the doors to the terminal were all closed so we had to stand outside until they let us in. 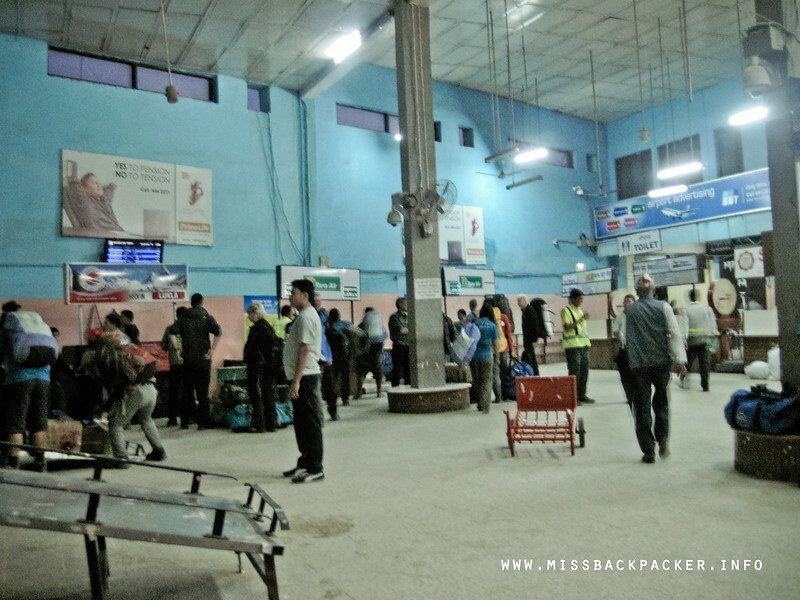 We arrived early at the Tribhuvan International Airport and we weren’t allowed inside. Once we’re in, it’s chaos. There’s heavy big backpacks everywhere. 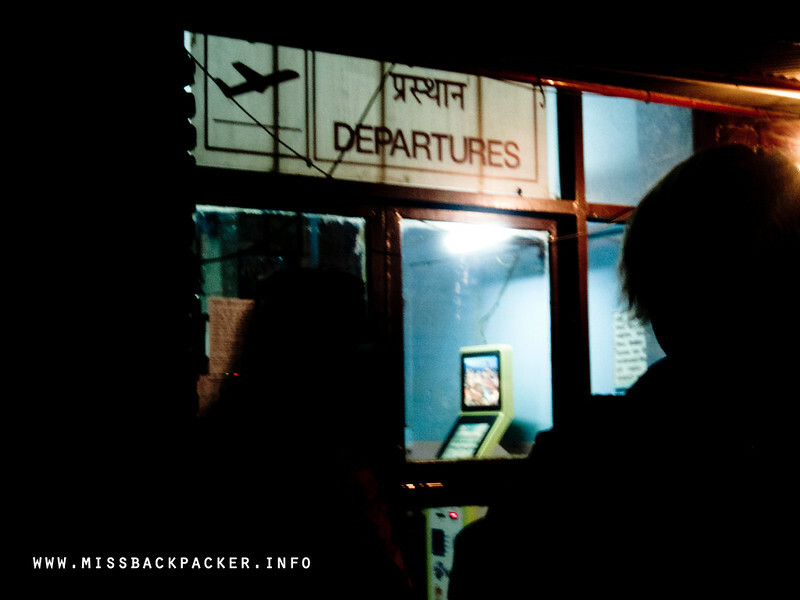 The terminal was filled with busy airline crews, porters, and guides, rushing and trying to meet the announced boarding time. I bet the people who rated our NAIA’s Terminal 4 as word’s worst airport have never ever set foot in Kathmandu’s. The small and unorganized domestic departure lounge of Tribhuvan International Airport. Anyway, after all the hullabaloos of checking in, weighing, verification of documents, and all that, we finally were able to sit when we were allowed to enter the departure lounge. In less than 30 minutes, we heard an announcement that flight 9N-AKE of Tara Air is ready for boarding. We stood up, lined up, and had ourselves body-checked by the airport authorities. The next thing we knew, we’re already on-board and just waiting for take-off. TIP: When flying to Lukla, make sure to sit on the left side of the plane as the Himalayas mountain range, along with amazing views of valleys, rivers, and villages can be seen from there. Ladies and Gentlemen, this is your Captain speaking. We like to welcome you on-board this Tara Air flight to Lukla. Flight duration is around 45 minutes and we are expecting a fairly smooth flight today. Once again we thank you for choosing to fly with us today. We hope you enjoy your flight. Alright. None of these words were uttered by the Captain who flew our 19-seater Dornier Do 228 twin-turboprop, the smallest I’ve ever boarded. In fact, I hardly felt him and his co-pilot’s presence if not for the open cockpit. What happened was our cute stewardess handed us candies labeled “Yeti Air” (apparently, Tara Air is a subsidiary of Yeti Airlines) and a bunch of cotton balls which could help us lessen the pain of ear popping. If you have been reading the newspaper and listening to news, you’d know that this year hasn’t been a great year for the aviation industry. This, maybe, caused the dream I had a few days before our scheduled trip. In my dream, one of the planes I would be boarding will crash and that I will die. You can’t blame flyers to have this fear instilled in their minds, right? Going back, the first few minutes were a pain to our ears because of the loud sound produced by the aircraft. When we started moving, all I could do was pray. Dear God, I am still young and there are still a lot of things I want to accomplish. Please do not take me that early. I still want to live. We took off safe and sound. A few more minutes and I was dozing off caused by the lack of sleep and, well, the very inviting condition inside the aircraft, serene and cold. I fell asleep for quite a while and when I woke up, I was in awe of what I was seeing. Though we have this kind of view back in the Philippines (Banaue, hello? ), it’s still surreal for me to see this lush scenery. See the white curvy line? That’s a river which name I don’t know. 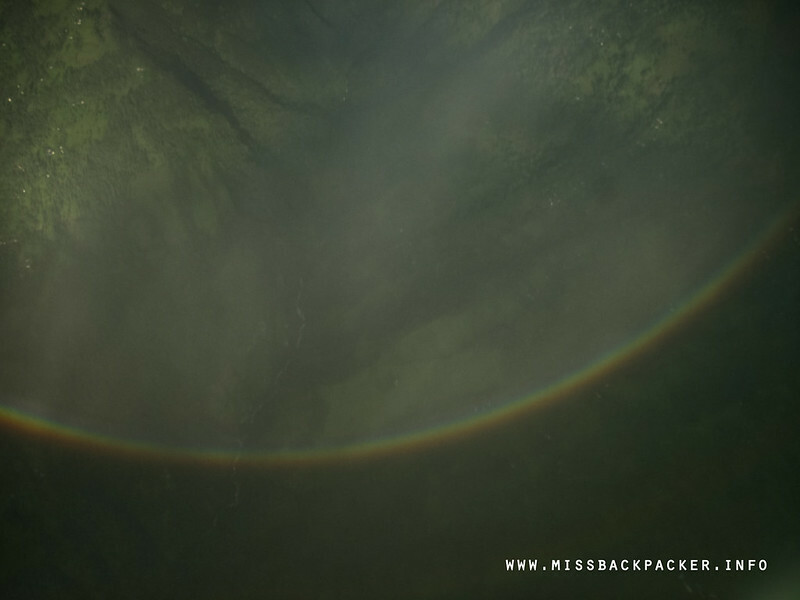 It drizzled quickly during our trip but when it stopped, here’s what we saw next. Truly there’s a rainbow after the rain. Because of the short rain showers, there were no mountain views for us. Sad. 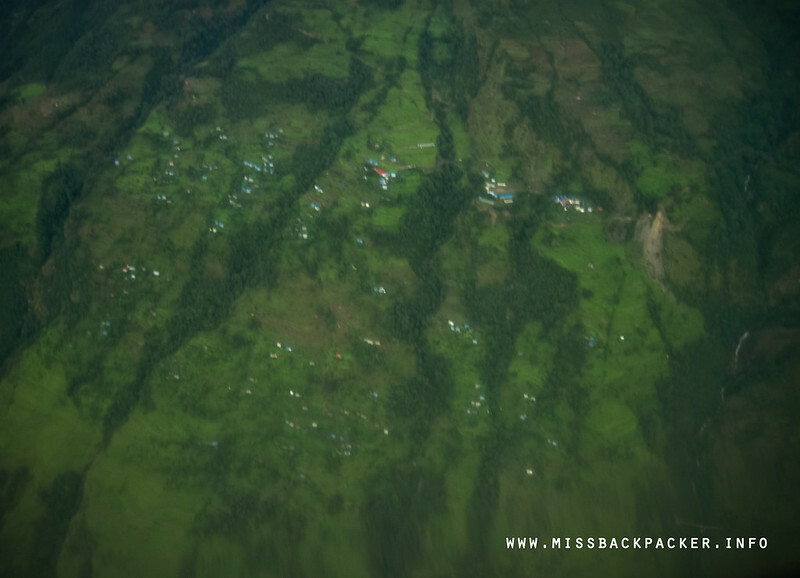 Nevertheless, the sights of the villages from above are fantastic! A reminder of how fun our EBC adventure could be. The houses from above seemed like dots. And then out of nowhere, a short and small line came into our view. But as we went closer, it made itself known as the infamous 460-meter-long and 20-meter-wide runway of the dreaded Lukla Airport. We’re here! I held on my seat armrest tightly. I would now know whether the aircraft will crash or not. The aircraft started plummeting toward the runway. In just a couple of seconds, the pilot started to ram the brakes on then we made an abrupt right-turn. This was done right before we hit the high mountain wall. 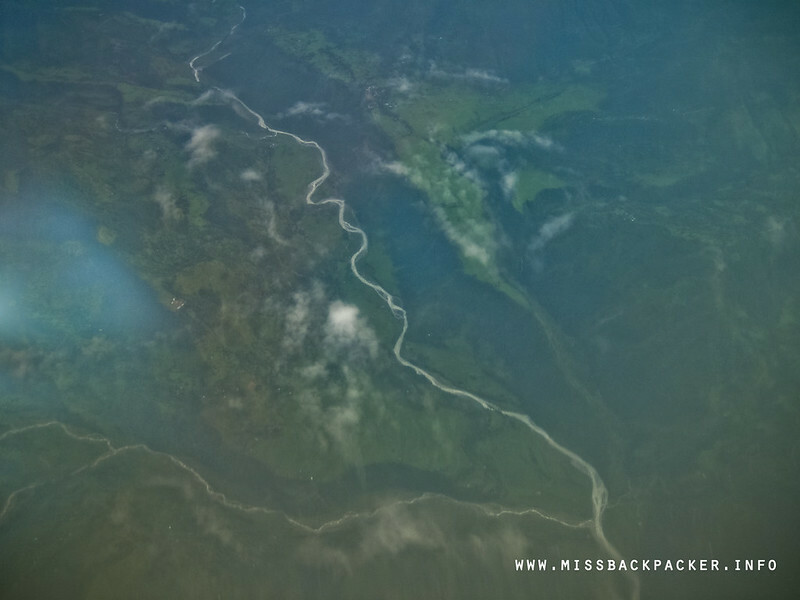 Here’s a video recorded by Rowjie as we touched down Lukla. The airport does not have a control tower, radar, or navigation, which a regular airport should have. 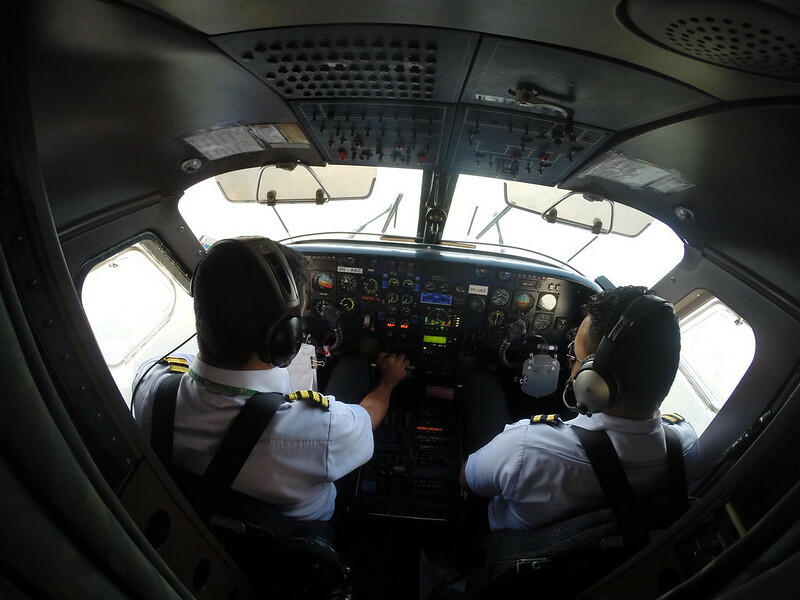 The pilots fully depend on what they can see from the cockpit for them to be able to land and takeoff. 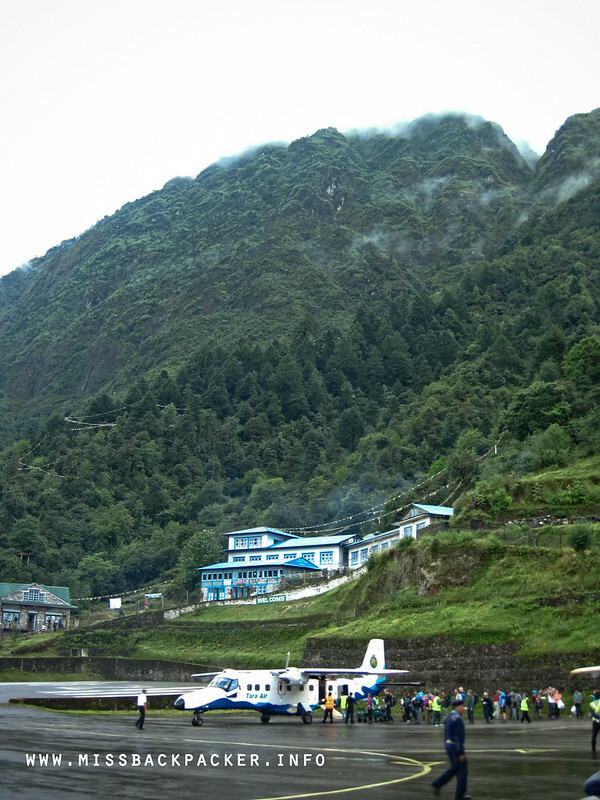 My first photo of Lukla Airport. The stewardess opened the door of the aircraft then unfolded and lowered down the ladder. She happily thanked us for flying with them before we disembarked the plane. So, that was it. That’s how it felt like landing on the world’s most dangerous airport. As History Channel had shown it, there were indeed guides and porters waiting outside the fence of the airport. Some of them are employees of a trekking agency while independent guides and porters are just hoping that another independent trekker would need their assistance and hire them. These locals heavily rely their income on the trekking industry. The arrival area of the airport. That’s Bikal, our guide. Here are my two cents. 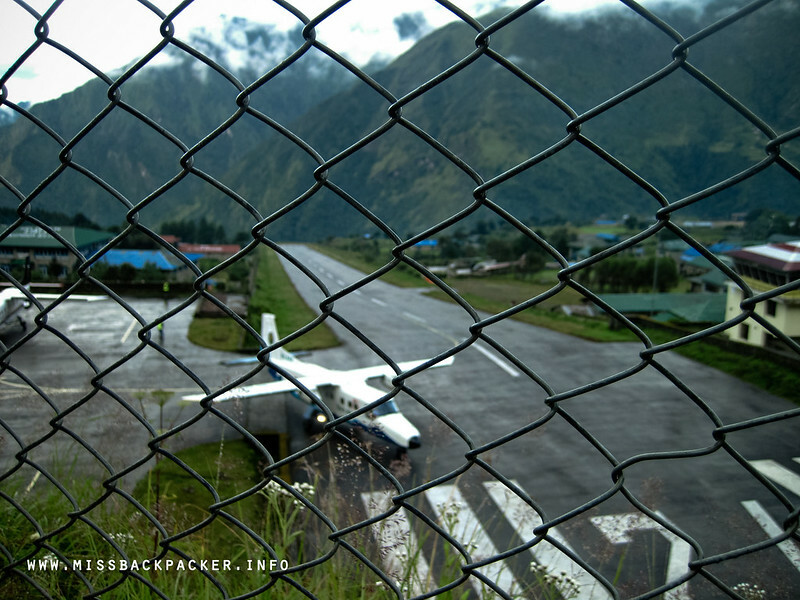 There’s really nothing to be afraid of Lukla Airport. The runway may be short, a tenth of the standard length, but the elevation of the airport gives the pilot an ample time to rise if, in any case, he fails to properly take-off before reaching the end of the runway. The extreme changes in the weather cannot be blamed as well because no matter how good the weather may seem (specially in Kathmandu), flights are constantly being delayed or cancelled to ensure the safety of both the crew and passengers. If there are some things that may cause an accident during taxing, take-off, or landing, it’s actually the pilot and or a defective aircraft. As far as my research is concerned, I haven’t read of any accidents that were caused by the design and location of the airport. Most were due to pilot’s negligence or a faulty aircraft. View of the airport from our teahouse. Actually, there’s another way for trekkers to reach Lukla. 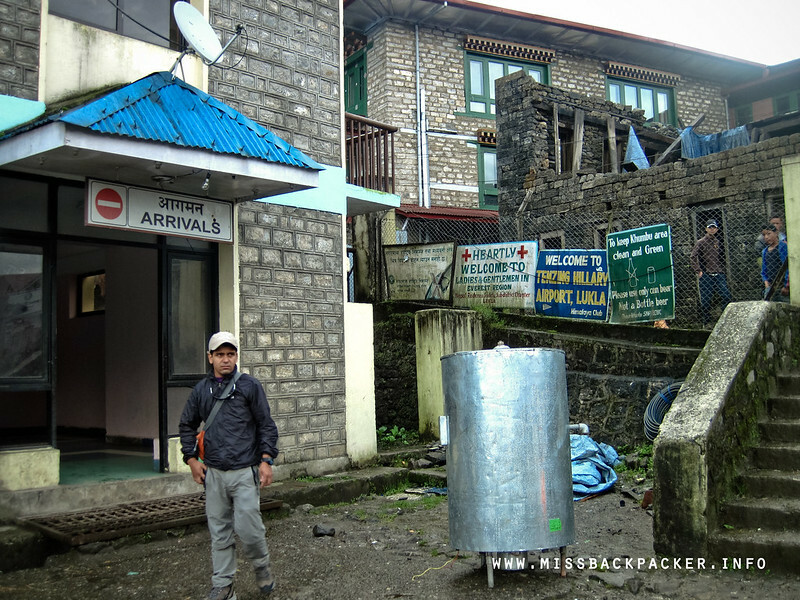 Aside from risking their lives flying to Tenzing-Hillary Airport, they can also hike from Jiri for six or more days depending on one’s phase or condition. If you’re to trek to Everest and its neighboring mountains, would you rather walk or fly? To help you decide, here’s another video of an aircraft taking off the world’s most dangerous airport.